Geordie Stewart grew up in Hampshire and Scotland. It was there he developed a passion for exploring in nature. Shortly before leaving school, despite no climbing experience, he decided to try and climb the highest mountain in every continent – a challenge known as the Seven Summits. 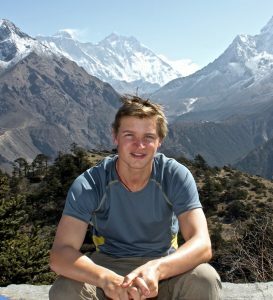 The following four years were spent pursuing this and, in 2011, he succeeded in climbing Everest on his second attempt, and became the youngest Briton to climb the Seven Summits. In 2018, Geordie wrote his first book In Search of Sisu about this period of his life. He has since graduated from the University of St Andrews and served for five years as a British Army Officer with the Light Dragoons. He currently spends his time undertaking adventures, promoting personal health and encouraging others to experience and challenge themselves in the natural world. I wish Geordie all the success and safety in this ambitious project. It will test his limits and that level of commitment is hard not to admire. An ambitious young man with genuine determination, Geordie’s attitude is inspiring. If you want to get in touch with Geordie to talk expeditions, public speaking engagements or his book then please use the form below.